The upcoming version 50 of the Opera web browser is particularly intriguing. Why? Well, it will offer a really cool integrated anti-Bitcoin mining feature. Besides Bitcoin, it will also block the mining of other cryptocurrencies such as Litecoin and Ethereum. If you aren't aware, some websites are hijacking user computers to mine for cryptocurrencies. This is not only a potential violation of trust, but it can negatively impact the computer's performance too. Mining is also a huge waste of electricity. Opera 50 will offer an optional setting that, when enabled, blocks this nonsense. Opera shares the following about the feature. Bitcoins are really hot right now, but did you know that they might actually be making your computer hotter? Your CPU suddenly working at 100 percent capacity, the fan is going crazy for seemingly no reason and your battery quickly depleting might all be signs that someone is using your computer to mine for cryptocurrency. This cryptocurrency mining can sometimes continue after you have first visited the site. But we, as the only major browser with an integrated ad blocker, have a built-in solution to keep miners from trespassing onto your machine. 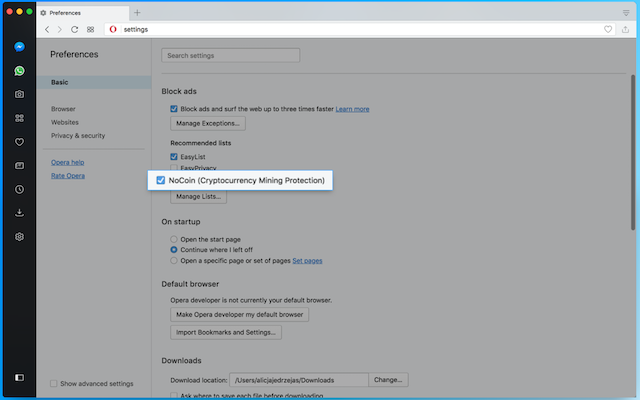 After we recently updated the rules for our built-in ad blocker mechanism, we eliminated cryptocurrency mining scripts that overuse your device’s computing ability. Simply enable Opera’s ad blocker to prevent cryptocurrency mining sites from doing their dirty work on your computer. You can find and change NoCoin in Settings (Preferences on macOS) > Basic > Block ads and under the Recommended lists of ad filters. As you can see in the above image, by enabling this anti-cryptocurrency mining feature, you can dramatically reduce CPU usage when browsing a site than is leveraging these mining scripts. Keep in mind, folks, this should also help battery life for those on laptops too. If you want to give the beta version of Opera 50 a try, you can use the below links. For those that prefer not to use pre-release software, a stable release shouldn't be too far away. With that said, this is a release candidate, so it should be fairly bug-free.